The musicians in this eleven-piece all star group have appeared with such notables as: Steve Allen, Ray Charles, Paul Anka, Tito Puente, Jack Jones, Maynard Ferguson, The Tubes, Al Martino, Del Shannon, The Drifters, and many others. SILVER MOON has performed at many of the Bay Area’s most prestigious events, including the 1996 San Francisco Symphony Gala at Davies Hall. With many years of professional experience, these talented artists can be counted on to play the appropriate style and volume level for any situation. 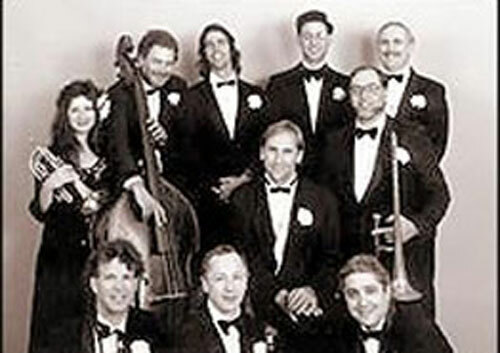 SILVER MOON BIG BAND specializes in weddings, anniversaries, and corporate events. Special ethnic and holiday music is available, as are classical duets and soloists for wedding ceremonies. The band is happy to perform special requests and band size is adaptable to the client’s needs or budget. Whether your celebration is black-tie or informal, rest assured it will be a fantastic success with SILVER MOON BIG BAND! This entry was posted in Big Bands. Bookmark the permalink.